Forecast for next week is not promising: temperature above 40C (100F) all week long. I was brave enough to cook a few meals and bake some bread, but most of our meals during the week will be cold, cold salads, beginning with a simple kale salad. Last Saturday at the Farmer's Market I stopped at the stand with a great selection of leafy greens with young kale being most attractive. I made this salad as soon as I came home from the Market. Wash the kale and set aside. Cut avocado, remove the pit, spoon avocado flash into a small bowl, mash it with a fork, add lemon juice and mix well. In a large mixing bowl combine kale and avocado dressing, mix well until all kale is coated. Refrigerate for at least 30 minutes. Serve with chilled sliced peaches. This salad became quickly our favorite, flavor is incredible. 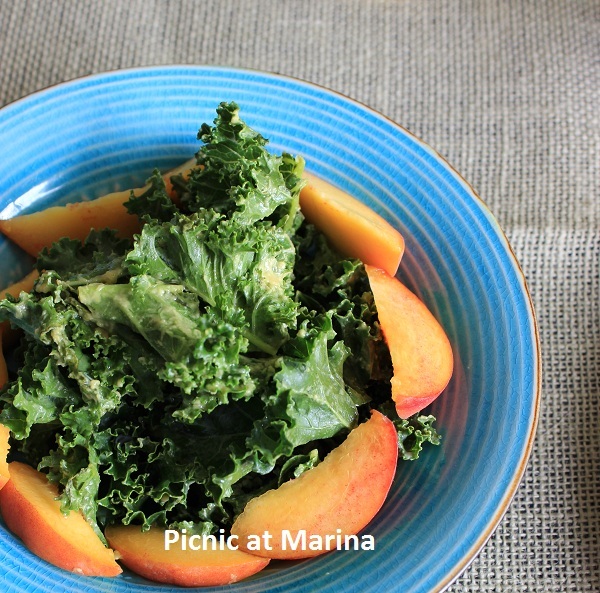 I tried other fruits, and even berries, but peaches make the best topping for the avocado coated kale. This is a beautiful salad! I bet it tastes as good as it looks. I'm going to try this! Oh wow, I had no idea that you temps got over 40 degrees too! It's so hot at that stage that all you want to do is escape into air conditioning or by a pool! That is hot! Hope it breaks soon. Salad looks great even if the weather is a bit much. I am still waiting for local peaches to appear in our farmers' market. Hi Walkiria, Nice seeing you here again! :) Thanks for your compliment on the photos. The dreaded summer is here. After reading your post, I quickly checked and the heat is heading into the triple digits here in Dallas as well this week. Your salad looks delicious, by the way! It's salads for us, too. Never combined peaches & kale before - I'll have to give that a try. Thanks. It works great, I make a whole bunch of kale, and keep it in refrigerator, then I add only peaches when serving. Oh this is a very helpful post and need to keep this! Thanks. Let me know if you try it. oh i love kale--i have never thought of having a cold salad with it--sounds really great! Try this with your kale: tear it off the stem, place in the colander and pour boiling water over it, then immediately place it in a bowl with a cold water for 2-3 minutes. Another way is to prepare this salad (without peaches), place in airtight container in the refrigerator overnight (don't worry, it has lemon juice in it as a preservative). Lemon and avocado will tenderize kale. Well, kale is one of my favorite things and I adore peaches, so I'm thinking I need to give this a go. I bet the sweet, juiciness of the peaches really plays well off of the kale. Yum! This sounds so good. We get the best avocados here in FL and I have one that is ripe! Oh looks really good. Thanks for the recipe. I'm always trying to figure out ways to eat dark greens like Kale. Have a great week. That avocado salad dressing sounds interesting! I will have to try that. It has been that warm here too, which is crazy for Colorado in June! Summer is here! Stay cool! 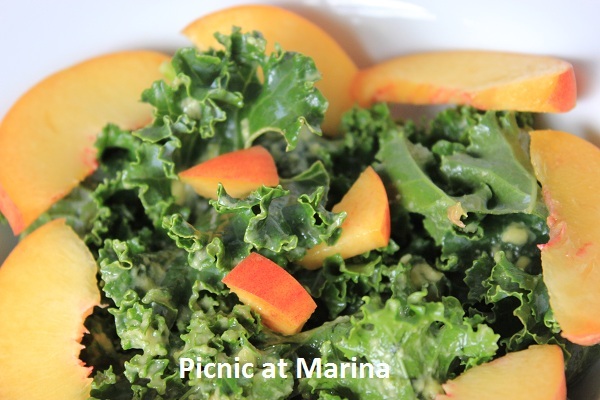 Never thought of pairing kale with nectarines of peaches... actually, I mostly cook kale really :-), I guess a kale salad is a novel idea to me altogether! I so much like greens but surprisingly I have never tried kale. I have to eat it especially after your salad that looks sooo convincing.